Get Cheap Hosting From Best Providers of Bangladesh. If a hosting service is affordable, you will want to go through its features and services. However, if it is not affordable, some may not bother about checking out its features. An end user will always want a affordable hosting service that provides quality services. A cheap hosting service may provide you with little support options. If you have any issue with your site or if your site is down for some reason, there should be enough support facilities to help resolve your problem. A good affordable hosting serviced will be the one that provides 24 x 7 support via email, skype, live chat and phone calls. If you have limited bandwidth, there is high possibility that your site will not properly and may show error messages to the site visitors. Hence, you should always go for unlimited bandwidth service that will let your site handle any number of traffic. In the same way, if the server space is limited, you won’t be able to add anything to your site and it may not launch properly. Hence, the hosting service should give you unlimited server space. It should allow you to add more domains to the account without paying extra money. It will greatly help in creating backlinks to various sites so that your site receives good traffic. cPanel is a control panel that is provided by most hosting companies to help you easily carry out website management and various hosting related processes. It is one of the important features of hosting service. Hence, you should whether you are getting this feature or not in a low priced hosting service. If you are going to use an e-commerce site on your hosting account, you will need to make sure that the hosting service provides you with adequate security features like SSL certificate. If your site is secure, people will consider your site as trustworthy and will often purchase from your site. A hosting company automatically becomes trustworthy if it has got years of experience. However, you can also trust a company with less experience provided that it has good reputation on the internet. You can research on the review and forum sites and check for negative feedback. If you keep the above points in mind while searching for a reliable hosting service, you will be able to find out several affordable ones that will easily fit in your budget. 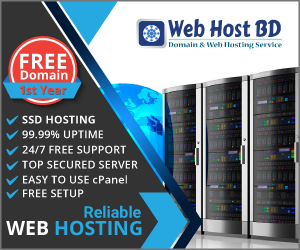 We can suggest Web Host BD And then you can make use of comparison shopping to choose the one that best suits your requirements.